The AQUA PRO 450 Incorporating 3 x 150 US GPD genuine USA produced Thin Film Composite Reverse Osmosis Membranes, This system will produce a large amount of pure water whatever your needs. The AQUA PRO 450 Reverse Osmosis system is supplied with a Pre Filter Housing Key, a Reverse Osmosis Filter Housing Key, a Quick Connect Water Supply Saddle Valve, Waste Clamp and 3 x 2 meter lengths of coloured poly tube for installation. This high quality RO System incorporates a Flow Restrictor Bypass Valve which facilitates manual flushing of the R O membranes or as an optional extra an Auto Flush bypass kit can be supplied with transformer and digital timer like in the image below also now available is the Polyprop mounting boards in black as shown below. 5 Micron Sediment Filter Made From 100% Pure Polypropylene Fibres, Removes Dirt, Sand and Rust. Granular Activated Carbon Filter Composed of High - Performance Activated Carbon. Removes Free Chlorine, Odour, Organic Contaminants, Pesticides and Chemicals. Carbon Block Filter, Composed of High - Performance Carbon, Removes Trihalomethanes, Pesticides, Volatile Organic Chemicals and 99.95% of Giardia and Cryptosporidium Cysts. 3 x 150 US Gallon per day High Rejection Thin Film Composite Reverse Osmosis Membranes. We strongly recommend that if you're mains water is via a water meter you will require a booster pump as the water meter reduces water pressure, please note this will greatly reduce wastage. By using a 'Reverse-Osmosis' (R/O) plant, your mains water can be completely stripped of all minerals and contaminants, essentially producing pure H2O, or distilled water. This R O water will usually have a TDS of perhaps 11ppm. Most of that 11ppm figure would actually be Carbon Dioxide, which makes the water acidic, but will quickly gas off, leaving you with a pH of around 7. R/O plant water on its own is very dangerous for aquatic life, as it has absolutely no pH stability, and no mineral content. But, when mixed back in with dechlorinated untreated mains water, you can make the perfect water, which can give you superb results! Lets say your mains water currently has a TDS level of 335ppm. Contained within that reading is the KH, which runs at 11dH (190ppm). As far as growth and koi development are concerned, not really that good for your koi. with dechlorinated untreated mains water at a ratio of lets say 75% R O water, and 25% mains water, which results in a TDS of just 84ppm, and a KH of 2.75dH, which is more like it. This may sound complicated, but provided that you know the KH value and TDS of your mains water before you mix it with R/O water, you can use the TDS meter to determine the KH value of your mixed water. In this case, if the mixed water TDS level rises above 84ppm, just reduce the flow of mains water a little, and if it's too low, then the flow is increased. Running the above KH reading is perfectly safe if you carefully watch and make regular notes of your pond KH level. Obviously, if the KH depletes below the desired level, you will have to either change more water, or add a 'harder' mix of water. unstable. It is dangerous to use R/O water without mixing it with mains water. Get The Most Out of Your Reverse Osmosis System. This Heavy Duty Pump is a Must if Your Reverse Osmosis System is Under Performing Due to Low Water Pressure. Very Quiet in Operation, This Pump Delivers 80 psi of Water Pressure to Your Reverse Osmosis System. The Pump is Supplied Complete With 12 Volt Transformer and Rubber Mounted Baseplate. Suitable for up to 3 X 150 US GPD Membranes in series. This pump is designed to be installed before the Ro Unit to boost the inlet pressure. There needs to be at least 40 psi and up to 80 psi of inlet pressure for the Reverse Osmosis Water Purification Unit to function properly. People on wells and other situations of low pressure can benefit greatly from this pump. It boosts the pressure up to 80 psi allowing RO unit to run with higher flow and efficiency while having better TDS removal. The 80 psi Booster Pump, specifically designed for this RO unit, is a workhorse but runs quietly. Comes cord and quick connect fittings. AMFOR® reverse osmosis membrane elements are the most reliable, advanced membrane technology available, the automated fabrication allows these elements to keep consistent performance. AMFOR RO Membranes will out perform any other membrane found in the UK. Please do not confuse these genuine Amfor USA membranes with any other on the market here in the UK. These are the best membranes money can buy and are used on our own systems. 100 US GPD (378 Litres) Per Day Thin Film Composite (T.F.C.) Reverse Osmosis Membrane. This Membrane Will Fit All Standard Reverse Osmosis Housings Supplied by Other Water Filter Manufacturers. 150 US Gallon Per Day Thin Film Composite (T.F.C.) Reverse Osmosis Membrane. This High Capacity American Manufacturerd R O Membrane is Very Popular With Koi Enthusiasts. This Membrane Will Fit All Standard Reverse Osmosis Systems Incuding Other Water Filter Manufacturers. This Filter Will Fit All Standard 10 Inch Filter Housings Supplied by Most Other Water Filter Manufacturers. 10 inch 5 micron high capacity polypropylene sedimentary filter for the removal of sediments, dirt, sand and rust. This is normally used in the first stage of a multi stage water Reverse Osmosis filter system. 10 Inch Granular Activated Carbon (GAC) Filter. Composed of High - Performance Activated Carbon. Removes Free Chlorine, Odour, Organic Contaminants, Pesticides and Chemicals. 99.95% of Giardia and Cryptosporidium Cysts. These Filters Will Fit All Standard 10 Inch Filter Housings Supplied by Other Water Filter Manufacturers. This box contains the standard 10 inch filters found in most Reverse Osmosis systems. 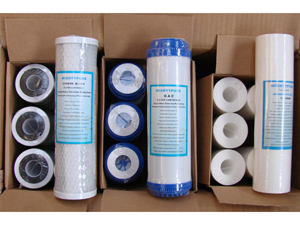 6 x 5 - Micron Sediment Filters Made of 100% Pure Polypropylene Fibres. Removes Dirt Sand and Rust. 6 x Granular Activated Carbon (GAC) Filters Composed of High - Performance Activated Carbon. Removes Free Chlorine, Odour, Organic Contaminants, Pesticides and Chemicals. 6 x Carbon Block Filters Composed of High Performance Carbon. Removes Trihalomethanes, Pesticides, Volatile Organic Chemicals and 99.95% of Giardia and Cryptosporidium Cysts. For customers who demand top quality tubing at a great price. Colors include White, Red, black & blue. Inline valve with pushfit connections for use with standard 1/4 inch connection tubing. These parts are made to the highest specification, and are suitable for water filters, RO Reverse Osmosis water filters. These connectors are designed for use in all cold water Reverse Osmosis applications and will last many, many years! 3/4 Inch bsp screw on tap connector with pushfit connection for use with standard 1/4 inch connection tubing. It is also Suitable For a Water Filter System When Used in Conjunction With our 3/4 Inch BSP Tap Connector. Elbow 1/4 Inch Pushfit Connector for use with standard 1/4 inch connection tubing. This high pressure switch is fitted on the output side of a booster pump and will turn off the power supply to the pump when the water back pressure increases as a result a blockage in the Reverse Osmosis system. Inline 1/4 Inch Pushfit Connector for use with standard 1/4 inch connection tubing. This Low Pressure Switch is located on the feed water side of your booster pump and will turn the pump off preventing it running dry on loss of mains water pressure. This waste water clamp will fit around a standard 40mm diameter waste pipe and accepts the Industry Standard 1/4 inch tubing used on most RO Systems. The greater the water pressure, the better the quantity and quality of the Reverse Osmosis water produced. Water pressure of 80 psi is ideal; we supply systems with and without booster pumps for both adequate and low-pressure installations. Water Pressure Gauge Supplied With a T Piece Push Fit Connector Enabling it to Fit Inline With a Standard 1/4 Inch Water Feed Pipe For an Accurate Water Pressure Reading. Tee Piece 1/4 inch pushfit Connector for use with standard 1/4 inch tubing. Water Filter Housing Elbow Pushfit Connector for use with standard 1/4 inch connection tubing. Water Filter Housing Pushfit Connector for use with standard 1/4 inch connection tubing. The Absolute Koi Reverse Osmosis System for koi ponds will remove 95-99% of all the contaminants from raw tap water. With a Reverse Osmosis System you can simply create your own water make up for your koi pond! Reverse Osmosis Systems employ a semi permeable membrane that removes not only particles but also an extremely high percentage of dissolved contaminants-molecule by molecule- from raw tap water. The membrane consists of several thin layers or sheets of film that are bonded together and rolled in a spiral configuration around a plastic tube (This is also known as a thin film composite or TFC membrane.) The material of the membrane is semi permeable: which means it allows water molecules to pass through while acting as a barrier to dissolved solids (i.e. : mineral and chemical contaminants). When the feed water stream passes across the surface of the membrane, the molecules penetrate the membrane surface, working their way around the spiral and collecting in the centre tube. The remaining contaminants are concentrated and washed from the surface of the membrane down the drain. Assume a membrane is semi permeable, allowing water to pass through while being closed to dissolved salts. Place a membrane between two compartments in a container then place a salt solution in one half of the container and pure water in the other half. Now a fundamental scientific principle comes into play. That is, two different concentrations of liquids within the same system will try to reach equilibrium (i.e. the same concentration of contaminants) on both sides of the membrane. Of course the only way for this to happen is for pure water to pass through the membrane to the salt water side in an attempt to reach equilibrium this is called Osmosis. What is the actual process of a Reverse Osmosis System? What factors affect the quantity and the quality of the water produced? 1. PRESSURE. The greater the water pressure, the better the quantity and quality of the water produced. Water pressure of 80 psi is ideal; we supply systems with and without booster pumps for both adequate and low-pressure installations. 2. TEMPERATURE. 24 degree centigrade is the ideal water temperature for R.O. systems, any reduction in water temperature will cause the production of purified water to fall. The maximum water temperature recommended is 29 degree centigrade. 3. TOTAL DISSOLVED SOLIDS (TDS). The higher the amount of dissolved contaminants in the water, the lower the quantity of water produced. A high level of *TOTAL DISSOLVED SOLIDS can be overcome with additional water pressure. 4. MEMBRANES. These are rated at various flow rates. What Warranty do I get with my R O System? The RO System (excluding filters) is guaranteed for 1 year for material and workmanship defects. All defective parts will be replaced free within the first year. What is the maintenance schedule for the RO System? The three pre-filter cartridges should be changed every 6 months. The first is a 5 Micron Polypropylene Sediment Filter. The second is a Granular Activated Carbon Filter. The third is an Extruded Carbon Block Filter. Failure to change the Filters every 6 months may allow chlorine to destroy the membrane. Depending upon the water it is treating, the Thin Film Composite membrane has a life expectancy of 2 to 3 years. The Post Carbon Filter should be changed every 12 months. When should the membrane be changed? One indication is a gradual reduction in water production caused by a layering of minerals and salts on the membrane surface. Another is a gradual deterioration in the quality of water being produced. This might mean the R.O. membrane is disintegrating and requires replacement. (Note: Our Total Dissolved Water Quality Tester can test the water and tell you when you should change the R.O. membrane). The Absolute Koi RO System contains a combination of filters which between them remove more than 98% of organic chemicals from the water. These include THMs(chloroform), DBCP, lindane, TCEs(trichloroethylene), PCEs(tetrachloroethylene), carbon tetrachloride chlorine, In addition to these organic chemicals, below is a partial list of other contaminants removed by the F.C.S. TFC membrane. The percentage of removal shown below is a conservative estimate. 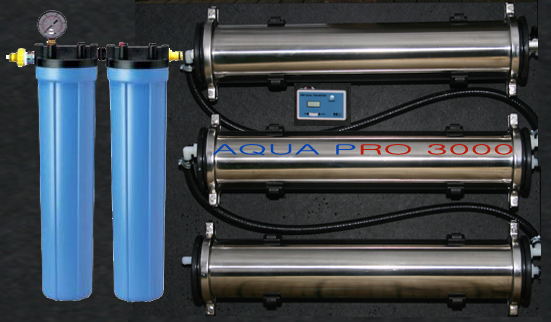 The AQUA PRO 3000 Incorporating 3 x 1000 US GPD genuine USA produced Thin Film Composite Reverse Osmosis Membranes, This system will produce a large amount of pure water whatever your needs. This high quality RO System incorporates 2 x 20 inch Pre Filter, 3 x Stainless Steel housings, a Manual Restrictor Valve and optional Auto Flush bypass kit which can be supplied with transformer and digital timer, also an optional Commercial Inline Dual TDS Monitor and Polyprop mounting boards in black as shown below. This unit is up and running in our fish house and is producing 1000 gallons a day on a 50/50 ratio, the first of its kind in the UK! We have a mains water supply with a TDS of 385, this unit gives product water with a TDS of 9 and a waste TDS of around 700 ! Carbon Block Filter, Composed of High - Performance Carbon, Removes Free Chlorine, Odour, Organic Contaminants, Trihalomethanes, Pesticides, Volatile Organic Chemicals and 99.95% of Giardia and Cryptosporidium Cysts. 3 x 1000 US Gallon per day High Rejection Thin Film Composite Reverse Osmosis Membranes. Ideal for water treatment as well as other industrial and commercial applications the DM-2 is the big cousin of the DM-1 with added features such as a stronger, water-resistant casing. Auto-Off function conserves battery power. The unit shuts off automatically after 20 seconds. Factory Calibrated: our meters are calibrated with a 342 ppm NaCl solution. Meters can be recalibrated with a mini-screwdriver. Comes equipped with 1/4 inch Mur-lok® Quick-Connect T-fittings. Also available with 3/8" or 1/2" fittings. Measure the TDS of tap water coming in vs. the RO purified water going out of your water filtration system at any time. Comes equipped with Mur-lok® Quick-Connect T-fittings. Fittings: 1/4" standard, also available with 3/8" or 1/2"
Incorporating 3 x 100 US GPD genuine USA produced Thin Film Composite Reverse Osmosis Membranes, This system will produce a large amount of pure water whatever your needs. This Reverse Osmosis system is supplied with a Pre Filter Housing Key, a Reverse Osmosis Filter Housing Key, a Quick Connect Water Supply Saddle Valve, Waste Clamp and 3 x 2 meter lengths of coloured poly tube for installation. This high quality Reverse Osmosis System incorporates a Flow Restrictor Bypass Valve which facilitates manual flushing of the Reverse Osmosis membranes. 3 x 100 US Gallon per day High Rejection Thin Film Composite Reverse Osmosis Membranes.